With the advent of cloud computing, scientists and engineers are looking towards integrating this service with the next evolution of computers; Quantum computers. 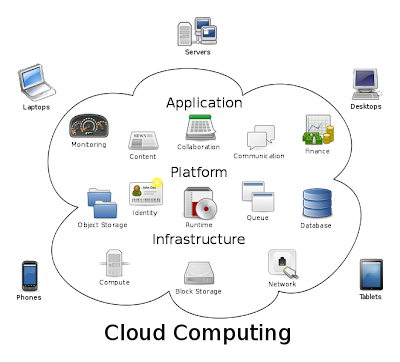 Basically, cloud computing is a service where all computer applications, data, and software are provided to computers and other devices as a metered service over a network or the internet. This does away with installing it directly to the computer. Everything is stored on a server or cloud for computers to access. Our present day computers (classical computers) use transistors to compute. The more transistors in a computer chip, the more processing power it has. The record for most number of transistors put on a chip is 2 billion. A quantum computer uses atoms for its computing power. To put simply, atoms, the way they behave, makes computing faster. A quantum computer can theoretically perform a calculation in one step where a classical or digital computer may take several. A classical computer can be programmed to dial a million phone numbers, it will perform this by dialing a phone one million times. A quantum computer can dial the same million numbers all at the same time, in one step. Researchers have succeeded in combining the power of quantum computing with the security of quantum cryptography and have shown that perfectly secure cloud computing can be achieved using the principles of quantum mechanics. They have performed an experimental demonstration of quantum computation in which the input, the data processing, and the output remain unknown to the quantum computer. The international team of scientists will publish the results of the experiment, carried out at the Vienna Center for Quantum Science and Technology (VCQ) at the University of Vienna and the Institute for Quantum Optics and Quantum Information (IQOQI), in the forthcoming issue of Science. Quantum computers are expected to play an important role in future information processing since they can outperform classical computers at many tasks. Considering the challenges inherent in building quantum devices, it is conceivable that future quantum computing capabilities will exist only in a few specialized facilities around the world – much like today's supercomputers. Users would then interact with those specialized facilities in order to outsource their quantum computations. The scenario follows the current trend of cloud computing: central remote servers are used to store and process data – everything is done in the "cloud." The obvious challenge is to make globalized computing safe and ensure that users' data stays private. The latest research, to appear in Science, reveals that quantum computers can provide an answer to that challenge. "Quantum physics solves one of the key challenges in distributed computing. It can preserve data privacy when users interact with remote computing centers," says Stefanie Barz, lead author of the study. This newly established fundamental advantage of quantum computers enables the delegation of a quantum computation from a user who does not hold any quantum computational power to a quantum server, while guaranteeing that the user's data remain perfectly private. The quantum server performs calculations, but has no means to find out what it is doing – a functionality not known to be achievable in the classical world. The scientists in the Vienna research group have demonstrated the concept of "blind quantum computing" in an experiment: they performed the first known quantum computation during which the user's data stayed perfectly encrypted. The experimental demonstration uses photons, or "light particles" to encode the data. Photonic systems are well-suited to the task because quantum computation operations can be performed on them, and they can be transmitted over long distances. Video: What are Quantum Computers?